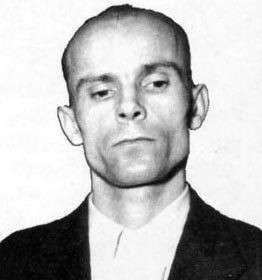 On this date in 1957, postwar Czechoslovakia’s most prolific serial killer was put to death at Prague’s Pankrac Prison. Other than the mandatory Wikipedia entry, most information on Mrazek available online is in Czech. But there’s little enough nuance to grasp. He was convicted of seven murders (and suspected in several others) to satiate his necrophiliac desires. In all over 100 crimes of sexual abuse and theft were laid at his door. Mrazek was nabbed by accident, rifling jacket pockets (more Czech) at a spa where he worked at an attendant: the subsequent search of his place turned up the evidence of far more villainous behavior, and led Mrazek to confess. hi,there are more reason for his long therm escaping. first of all his modus operandi: he didnt really mind age or look of his victims.they were chosen almost randomly.he used pistol, knife, club and axe.another aspect is he was pretty low profile person,small, thin, uniformly dressed and always described as calm,shy and polite. what really got him in the end was his kleptomania, almost everything in his appartment was stolen, from food to sheets, and he also kept stuff from his victims.